Ali is an engineer, inventor, author, consultant, and Six Sigma / Lean coach. His 19 years in top companies have included pioneering global assignments. Ali holds his doctorate in organizational leadership. He has been published internationally and teaches at the University of Phoenix and Chapman University. Kevin has 30 years of Fortune 100 experience in marketing, engineering, business and leadership development. He holds a doctorate in organizational leadership, an MBA, and a BS in Commerce and Engineering. He is the Senior Research Chair for Organizational Behavior at the University of Phoenix. The 101 secrets will enable you to emerge as a marvelous leader. Are you a manager with a Staff? Make a difference by giving the gift of Marvelous Leadership! 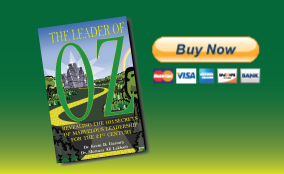 The Leader of Oz is a leadership book inspired by Frank Baum's "The Wizard of Oz," and puts leadership and managemet in a fresh light by delivering tools to evaluate leadership styles that will help individuals emerge as a marvelous leader.